« 26 March 1987: Alan Smith signs from Leicester for £750,000. The History of Arsenal – Where Did It All Go Wrong? On 26 September 2010 Arsenal’s history changed. That was the day that Tony Attwood published this article about Bobby Buist, an Arsenal player from the 1890s. I added a comment including a link to a match report of a game that Buist was reported to have played in. But when I read the report I noticed that his name was missing. Further investigation showed that he didn’t join Arsenal until eight months later. What was strange was that this story was one that was ingrained in Arsenal folklore. It was in all the Arsenal history books. And yet here we had a player playing in an Arsenal match eight months before he joined the club! How could it be so wrong? Over the years I’d collected a fair number of Arsenal books so I started working my back to find the origin of the story. Eventually I found it in The Book Of Football that was published in 1905. A brief history of the club was written by Arthur Kennedy, a director of the club. 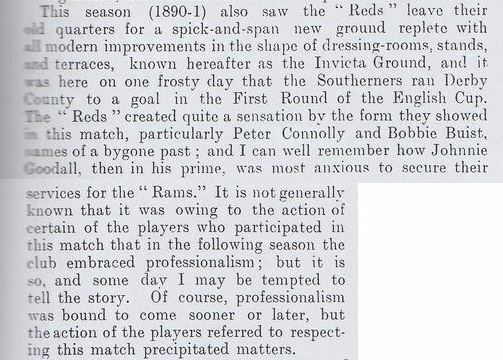 This was then copied by George Allison (who became Arsenal manager in May 1934) for an article in The Sportsman in 1907 and a history of the club for the 1914-15 handbook. If respected journalist, broadcaster, Arsenal director and Arsenal manager Allison had written it then it must be right. Right? Well, obviously not. Tony and I then started to look at other stories in Arsenal’s early history. It seemed that every time we questioned a story, something wasn’t quite right. Mark Andrews then joined our merry little crew and between us we found more and more discrepancies between what all of us Arsenal supporters had believed was the club’s history and what really happened. Of course, not everything was wrong, but a huge chunk was. And a fair amount of it involved the major events. In particular, the story that Arsenal’s landlord increased the rent of the Invicta Ground in 1893 following Woolwich Arsenal’s election to the Football League. Apart from the fact that this is arse about face it dramatically understates the real story. Having identified these errors and fully researched what really happened we wanted to let fellow Arsenal fans know what we’d found. We’ve been writing articles on this blog where we’ve shown these stories to be incorrect and written both booklets (which are issued free to Arsenal Independent Supporter Association members) and books (which are listed at the foot of this article). We’ve made a few errors along the way ourselves. I wrote in the first AISA history booklet that Morris Bates had been one of the founders of the club. We’ve subsequently found out that he wasn’t. That’s what comes from blindly copying someone else’s book. Since Mark pointed that out to me I’ve not believed anything until I’ve clarified it myself. What I have found strange is that when I’ve pointed out these errors to certain people and shown them proof of what actually happened, they’ve denied the validity of the historical documents that I have shown them. In short they have become “History Deniers”. Why would someone continue to believe something when they have been shown that it isn’t correct? And besides, does 100% accuracy really matter? Does it matter if Royal Arsenal became Woolwich Arsenal in 1891 or 1893? After all, it happened, so who cares about the exact date? Does it matter whether or not Royal Arsenal were shunned by clubs from the south after turning professional? Or that Arsenal’s second manager was William Elcoat, not George Elcoat? Or if the meeting that saw Arsenal elected to the First Division in 1919 happened in March (before Leslie Knighton was appointed manager) or June (after he was appointed)? What about if it was stated that Martin Keown left Arsenal to join Everton? Or that Arsenal moved to the Emirates in 2005? In short, does any historical accuracy matter? Does it matter more if it is recent history (as that is still fresh in our minds and we are more emotionally attached to our memories) rather than in those tales of long-forgotten players and officials from 120 years ago? And at what point does a history book become unreliable and, therefore, not able to be quoted as a source? There are a number of Arsenal books in print that are riddled with mistakes and, in some cases, fabricated stories. At some stage you have to stop and ask yourself, “is this a true representation of events or a series of ripping yarns?” Which would you prefer? For ourselves, we prefer accuracy. We believe it is worth seeking out, so that even if other people continue to tell a false version of history, there is at least one place where you, as a person interested in the history of our club, can get a version of events that is based on evidence gathered from contemporary documents. Mark, Tony and I have set ourselves the task of setting the record straight. I do hope you find our efforts worthwhile. 3 comments to The History of Arsenal – Where Did It All Go Wrong? I think you boys do a great job and service to both the club (whether they agree or not) and its fans. It’s hard to find people so dedicated and that alone should show the club and its higher-ups that your hearts are in the right place. Perhaps, one day soon, your findings and expansions of our history will be accepted officially by the club and placed in our historical records. Here’s to hoping.